Since this lunation of 5 is close to your birth sun, you will start a nineteen year cycle and the expression of your personality will change a lot. Is it a rebirth? This month you can take care of yourself and the way you look in order to improve your image. It will make you shine when you are in society. But don't overdo it and stay yourself as much as you can because what's bred in the bone comes out in the flesh. You will spend more time taking care of your projects, especially with the ladies. You have much closeness with your daughter (if you have one). Your initiatives will pay off at work and people appreciate the way you live your life. Make sure you combine productivity and profitability. The Lunar Nodes in square to your Sun will make you rethink the past situations you have been through in order to not reproduce the same mistakes. Let go of the past! Pluto is in dissonance and you realize now you have been living in the past for a long time. You have to focus on the now and not on the past. Thanks to Jupiter life is much more pleasant, communication with others is easy and you smile or laugh a lot! What else? Saturn in dissonance will help you go back to school: the school of life that will make you accept the lessons taught by the elders and respect the law. 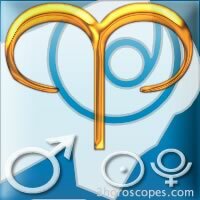 Aries, do you know your zodiac sign ?